The rise of gourmet cuisine in the UK has given rise to the new phenomenon of restaurant managers and chefs deciding to use only UK or locally based produce. While pre-war this would have been a relatively common way of operating - due to the high cost (in those days) of importing goods, and perhaps a widespread wariness of trying 'foreign' foods - the post-war economy in the UK boomed and we have become used to imported foods being high on our daily and weekly diet. Meals such as pizza, pasta, and curries (a curry is rumoured to be the UK's favourite national dish these days, according to food magazines and some food writers) are common and Britain has absorbed these dishes into its fluctuating national cuisine. 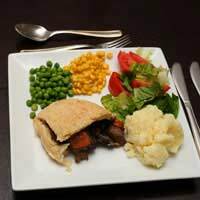 Of course it is possible to make any dish that originated abroad from fresh British produce (although there may be a problem sourcing some of the herbs and spices for some particular curry dishes), but what of the emphasis on using British-produced food only and highlighting the regional quality of these dishes? Below are some restaurants around the UK that emphasise British cooking, using only British and regional produce. The New Moon Restaurant, Kendal - This restaurant emphasises its 'Best of British' cooking policy and uses only produce sourced from the local area. The Millstone at Mellor, near Blackburn, Lancs. - This brewery-owned, village Inn restaurant, is justly famed for its emphasis on using fine produce from the Lancashire region only. This great restaurant and art gallery, nestling next to Ely Cathedral, offers seasonal and traditional local food, and a second helping of your main meal! The Butley Orford Oysterage, Orford, Suffolk - This Internationally acclaimed fish restaurant, has 3 boats of its own to ensure it has its own daily catch, and a smokehouse, where salmon and eel and many other delicacies are smoked daily over oak logs! A must if you are ever in the area - and worth a special trip too ! This is just a personal and regional selection of a few restaurants known for their commitment to British and regional food. Check out the options near you - in London, Edinburgh and all the country's big cities (and now in towns and villages too), there will be many other restaurants trumpeting their use of British food exclusively. Get your taste buds out to discover them! Some restaurants and restaurant-owners, like Jamie Oliver's Fifteen, don't make British food their only choice, but are committed to using it where possible, and when supply allows. There should always be a choice for consumers between national and international cuisine - it is us discerning diners who set the agenda and the chefs and managers who work to the palate of the public. Don't forget that we can ask for our favourite dishes and British food - talk to and influence the chefs and restaurant managers of this great food nation. Eat well!